Hearts to the Rescue: York, PA: Lived in a crate for 11 years! Needs a cart! York, PA: Lived in a crate for 11 years! Needs a cart! The nicest dogs sometimes have the most horrible upbringings, and Lucy lou is no exception. This darling little lady is 11 years young and for all 11 years she endured a life of neglect and confinement. 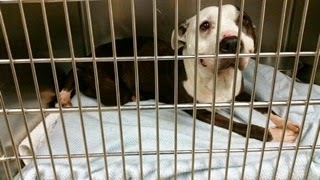 Her owner is now deceased, and a relative surrendered her to the shelter for euthanasia. However; we think she deserves a chance at real love and luxury. Lucy Lou not only lived confined her entire life; she has an old pelvic fracture that was left untreated and it makes it impossible for her to walk. Lucy Lou is not paralyzed, however; she cannot walk. She goes to the bathroom when taken outside and she is a docile, quiet, loving, grateful, kind soul. We are urgently seeking an alternative solution for her. Being a shelter, we do the best we can, however; we are not a home and a home is what this girl really needs. Additionally, she is a great candidate for a set of wheels which will make her life much improved. I have never even heard Lucy Lou bark and we are all smitten with her. She appears to be amiable with other animals and she is truly a survivor!!!!!!!!!!!!!!!!!!! Lucy Lou is a petite pit bull, roughly 35-40 pounds, but her heart is huge!!!! Please contact me asap if you are able to help our amazing girl! Lucy Lou is available to rescues only at this time due to her current needs and inability to ambulate. If you would like to foster her for a rescue, please contact me at: zscooter@verizon.net.